On May 16th Cardinal Council SAAC voted Scott Anderson, MA, ATC, FMSC, DNSP held the 4th Annual STANNY Awards at Hewlett Auditorium. The STANNY Awards is Cardinal Council’s way of celebrating all of the Stanford Athletics’ accomplishments throughout the year. 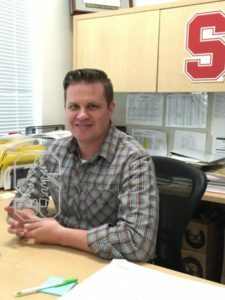 Four members of the Stanford Sports Medicine team were nominated for the 2016 Most Inspirational Athletic Trainer. “We were so happy to expand our awards a little to recognize people who deserve it. When we talked about adding a coaches’ award it only made sense to also do an award for our ATs as well. No one would stay healthy without you all!” Justin Brinkley Cardinal Council SAAC executive member. The Most Inspirational Athletic Trainer STANNY is awarded to the athletic trainer who is crucial to the success of the team. They make the time you have to spend in rehab, injury recovery, and treatment as smooth and positive as possible and will do anything to help the team perform at its peak.